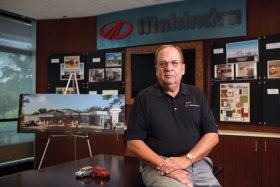 John Perez, founder of Global Vehicles, with renderings of the Mahindra dealerships he has been trying to create in the United States: "I believe that, legally, I'm still their U.S. distributor. And I want trucks delivered to our dealers." John Perez's plan to find an undiscovered global automaker and deliver it to the United States burst into flames -- just when it was a whisker away from success. In August, after four years of waiting for Indian truckmaker Mahindra & Mahindra Ltd. to get its compact diesel pickup certified for U.S. sales, Perez found himself ousted from the distribution deal he created. Six days later, Mahindra said it had won approval from regulators in Washington to go ahead with U.S. sales of the pickup. After quarreling for a year with Perez over his finances and marketing plans, the Indian manufacturer informed the world in a terse, unilateral announcement in August that its contract with Perez's company, Global Vehicles USA Inc., had expired. Perez had already sued Mahindra in the United States and filed for arbitration in England by then. Most recently, Perez sent Mahindra an order for pickups -- which Mahindra rejected. "I believe that, legally, I'm still their U.S. distributor," Perez says stoically in his deep baritone voice. "And I want trucks delivered to our dealers." That question will be decided in court. But the story of how the plan to sell Indian pickups in the United States hit the skids is one of broken trust, fights over money -- and 347 dealers potentially left out in the cold. Mahindra says the dealers that Perez recruited to his distributorship have no valid franchise agreement. The automaker says it will consider granting franchises to the dealers, who paid Perez up to $200,000, but is not obligated to do so. One lawyer for dealers says they may wind up suing Perez, even as he fights to keep his company -- and their franchises -- alive. For Perez, a 63-year-old Cuban-American businessman from Atlanta, it was the second time such a deal has imploded. For more than a decade, he tried and failed to import a Romanian SUV called the Aro and later renamed the Cross Lander. The soured relationship with Mahindra is in court in two countries. In June, before Mahindra declared the contract expired, Perez requested arbitration in London, as the contract requires, to force Mahindra to drop financial demands it was making. He then sued in U.S. District Court in Atlanta, asking a U.S. judge to force Mahindra to do business with Global Vehicles and its dealers. Dealers have been waiting since early 2009 for the start of truck sales, which has been delayed three times as Mahindra sought regulatory approval for the truck. If Mahindra succeeds in ending its relationship with Global, which it refers to as "GV," the dealers would have no legal relationship with Mahindra, a spokeswoman said. In response to questions from Automotive News about the fate of Perez's dealer body, Roma Balwani, Mahindra's senior vice president of corporate communications in Mumbai, offered this written answer: "That is an issue for GV, not Mahindra." Asked if Perez's dealers would retain their franchises if Mahindra succeeded in ending its relationship with Perez's company, Balwani wrote: "The current dealers' contract is with GV and hence they do not automatically become Mahindra dealers. However, we would be considering these dealers for our network if they are interested." Balwani wrote: "The dealer contracts are with GV. We will need a new distribution network and soon we will start a dialogue with potential dealers, including the ones who are signed up with GV, if they are interested in signing up with Mahindra." Robert Byerts, a Florida lawyer who represents some dealers who signed on with Perez, has been tracking the affair. "Somebody is going to get sued here," Byerts warned. "There are laws in some states -- not all states -- that specifically address this issue of whether a manufacturer can replace a distributor and its dealers." The statutes Byerts refers to are sometimes called the "Jim Moran law." The late Chicago retailer Jim Moran became a billionaire through his ownership of Southeast Toyota Distributors Inc., an independent company that has controlled Toyota sales and distribution in Florida, Georgia, Alabama and the Carolinas since the 1960s. Statutes in Florida and Georgia specifically prevent a manufacturer from eliminating a distributor like Moran -- or theoretically Perez -- unless it has specific complaints against him. Even when there are such complaints, the manufacturer is required to give the distributor time to correct his problems. But Byerts, whose law firm advises auto dealers on franchise issues around the country, admits that the law is a bit gray. "I don't know that any of this has ever been tested in court," he acknowledged. "When you come down to it, there really aren't too many vehicle distributors in the United States. And what few there are, I can't say if any of them has ever been challenged by a manufacturer." John Perez says Mahindra used the contract clause above to reject him as its pickup distributor. But who would be the most advantageous target of a dealer lawsuit? Perez and his company, which is trying to keep its plan -- and dealers' franchises -- intact, or Mahindra, which says it has done nothing more than follow its contract? To complicate the situation further, some of Perez's Mahindra dealers were grandfathered into a Mahindra franchise at no cost after investing with Perez to become Cross Lander dealers. But at least half of his 347 Mahindra dealers paid fees for their franchise arrangements. Automakers do not sell franchises; they award them for commitments to invest in stores and inventory. Byerts said dealers who signed on with Perez and are left without franchises would have little recourse but to sue Global Vehicles to get their fees back. Mahindra likely would be a co-defendant, he said. Mahindra is a diverse Mumbai-based industrial conglomerate run by Anand Mahindra. Its primary U.S. exposure to date has been through the sale of diesel tractors and information technology services. Mahindra's automotive sector is run by Pawan Goenka, a former General Motors executive. When contacted by Automotive News, dealers who had signed on with Perez largely demurred from discussing the situation. One dealer, who asked not to be identified, said he expects to write off the franchise fee, adding that it was a speculative investment. Neither Perez nor Mahindra has communicated with him lately, the dealer added. Another dealer, Larry Neuwirth, owner of Safeway Chevrolet in Burgaw, N.C., paid Global $200,000 and remains optimistic the truck somehow will make it to market late this year. "I'm not going to sue anybody," Neuwirth said. "What good would that do? We all knew this was a gamble when we got into it. We did it anyway. And I still believe it's going to work out." Indeed, both Perez -- a former Atlanta Dodge-Chrysler dealer -- and his alienated partners at Mahindra also insist things will work out. They just disagree on how. "We are working diligently to bring the product to market," Mahindra's Balwani told Automotive News. "It will be our endeavor to not let this dispute and the changed business circumstances affect our plans to introduce our vehicle in the United States." Perez said he also is trying to move forward. On Friday, Sept. 24, Perez ended the day by sealing a Federal Express envelope and sending it to Mumbai. Inside were factory orders for approximately 2,000 Mahindra pickups, an order worth $35 million. A press release Global sent out that day alerted newspapers around the country that the company was taking steps to bring in the trucks. It did not mention the legal morass. Mahindra rejected two previous orders he submitted in 2009. According to court documents, the manufacturer alleged that Global vehicles did not have adequate capital to pay for the trucks -- an allegation Perez denies. He said the rejections caused him to question Mahindra's intentions. He traveled to Mumbai and accused executives there of attempting to undermine his distribution deal. Last month's vehicle order was the first Perez had submitted since the truck received regulatory approval. But the following Monday, Mahindra issued its own press statement. It rejected the Global order and called the move "theatrics" and an "attempt to damage Mahindra's reputation." Even the question of how the partnership ended -- if indeed it has -- is a matter of ongoing debate. In explaining Mahindra's actions in ending the arrangement, spokeswoman Balwani says Mahindra did not "end" it. She blamed Global Vehicles for failing to extend its deadline, as Global had done in the past, she said. Perez says that is untrue. The partners did have a June 11 deadline for consummating Mahindra's U.S. market entry. Both sides acknowledge that the deadline had been extended previously as Mahindra prepared its truck for U.S. regulatory scrutiny. But Perez says the base for the deal's collapse was laid four years ago, in the late-night hours immediately before the partnership was created. It was in Paris in September 2006, as he tells it. Perez and his two primary partners and private investors had traveled there to sign the U.S. distribution deal with Mahindra. With Perez was Manuel Baez, a fellow Cuban-American investor who had been executive vice president of health care giant Baxter International Inc., and Bill Goetze, an auto industry veteran who worked for 40 years with Chevrolet, Chrysler, Mazda and Subaru. Baez remains chairman of Global Vehicles; Goetze has retired and moved to Edgewater, Fla. Reached by Automotive News, Goetze says he remains a shareholder in the company. At that point, Global Vehicles and Mahindra had agreed upon contract wording. Perez said the next morning's signing was to be largely ceremonial. According to Perez, he was in his hotel room at 10:30 p.m. when the room phone rang. On the other end was a Mahindra executive also staying at the hotel, telling Perez there was a problem. According to Perez, the Mahindra executive told him the board in India wanted a last-minute clause added that protected them in case Mahindra couldn't win U.S. approval for the pickup. The clause set a date when the parties could give up and walk away, with no liability. Perez said he called his partners in their rooms, dressed and went downstairs to talk through the clause. Goetze, who said he vividly remembers the late-night crisis, says he suggested that the contract signing be postponed until lawyers in America could review it -- a recommendation Perez also recalls. But Perez told his partners there was no need for that. The clause was harmless and sensible and could be penciled in with no problem, he recalls telling the group. 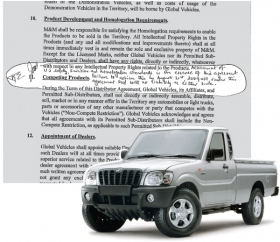 The walk-away clause was added, permitting the deal to end on Aug. 29, 2009, if Mahindra failed to get the truck homologated for U.S. sales. It was that clause, later extended to June 11, 2010, that Perez says Mahindra used as its out when it announced in August that the deal was dead. A key question: Does the clause grant a unilateral right of withdrawal, with no advance notice to the other party? A copy of the penciled-in addendum provided by Perez does not address the issue. On Aug. 26 -- just six days after Mahindra declared the Global deal dead -- the EPA certified the truck. According to Mahindra's interpretation, that left the automaker free to market it in the United States as it saw fit -- and Perez out of the picture. Perez said he's stunned by Mahindra's bailout. "I wonder all the time: Why is this happening?" Perez asked out loud in his partially empty offices in Alpharetta, Ga. "Why is this happening? I thought we were friends." Perez acknowledged that he was arguing with Mahindra over financial matters. He said Mahindra asked him to have $29 million in his bank account to cover marketing and advertising costs for the truck's entire first year of sales. Perez balked, arguing that no such requirement was in his contract. On top of that, he argued, marketing is not funded that way in the U.S. industry. He told Mahindra that marketing funds are collected from the sale of vehicles. But as recently as May, those disagreements appeared to be resolved. In a telephone interview with Automotive News on May 12, Goenka said the issue was subsiding. "I think Global has sufficient cash available for to launch in the U.S.," Goenka stated then. He said concerns about marketing funds were "getting sorted out now." He added: "By the time we launch, there will be no question of financing." When asked what changed at Mahindra between the time of Goenka's May comments and the company's Aug. 20 statement that the deal was dead, Balwani answered: "What changed was the inability to reach a satisfactory level of understanding with GV on the marketing plan." But in his May interview, Goenka expressed contentment with the marketing plan. He said Mahindra would pay for a pre-launch brand advertising campaign to help U.S. consumers understand what Mahindra is. Mahindra and Global together would pay for marketing during the actual launch, he said, and Global would then take over the cost of post-launch co-op dealer advertising. Perez told Automotive News his company has invested $57 million in the Mahindra deal. Half came from the dealers' franchise fees, he says. The other half came from private investors like Baez and Goetze. Goetze, who was Global Vehicles' president until his retirement in 2009 at age 72, said the startup was expensive: "Putting together a dealer body of almost 350 dealers and all the systems that will support it is pretty costly." Perez is adamant that he has not mismanaged the business or squandered dealer funds. "Nobody took money from the dealers and bought a yacht," he said indignantly. "The money we got from the dealers we reinvested back into the company, plus our own cash. "We're clean. Our books are audited every year. I can lay my head on my pillow at night and sleep good." Perez extends an olive branch to Mahindra, saying that an entire dealer network and sales and service organization is prepared to begin selling trucks and is "waiting for them on a silver platter." He added: "If Mahindra would move forward, I could look the other way. I can forget everything that's happened and move forward." But Mahindra doesn't appear to be interested.